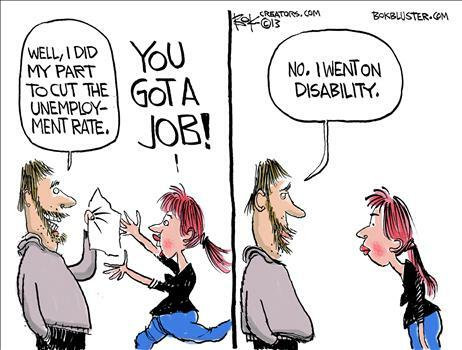 Of course, an intentional effort to bring more of the long-term unemployed onto the disability rolls might be defended as counter-cyclical fiscal policy and on immediate humanitarian grounds. However, the accelerated depletion of the Disability Insurance Trust Fund implies “that the payments to individuals receiving … benefits will be reduced by nearly one-fifth.” Such cuts would be extremely unjust to those suffering from more legitimate disabilities. In any case, this makes the pretext under which payroll taxes are collected highly suspect. It would be interesting to know whether changes in the disability rolls or benefit payments bore a correlation to economic growth over a longer history. The social gains from pooling risks at this level are easily frittered by mismanagement and fraudulent activity, faults to which government activity is particularly prone.